Sawarne's Clear Vertical Grain Heart (CVG) is the highest grade available. The majority of pieces are completely clear, with allowance for only the slightest imperfections that do not detract from the fine appearance. No.2 Clear & Better grade lumber is our finest quality rough lumber. 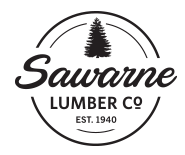 Sawarne produces No.2 Clear & Better lumber that is sound and well manufactured. We strictly limit the appearance of natural growth characteristics during the manufacturing process so as not to detract from the wood’s fine appearance. Sawarne’s #4 Clear grade offers good appearance in high quality, well manufactured cedar lumber. Sawarne produces this grade of lumber for applications such as high quality landscape structures and as exposed posts and beams in heavy timber construction. This grade is produced without cut-outs. In most cases, Sawarne sells this grade with a specified allowance of #4 Clear.